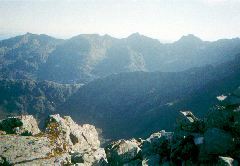 The Skye ridge, more properly known as the main ridge of the Cuillin, is Britain’s answer to an alpine ridge. Whilst never more than 1000m in height, its intricacy and route finding problems more than make up. In general the British hills are less dramatic than those found in many countries. There is one exception, The Cuillin of Skye. Situated on the south western corner of the winged isle, the Cuillin are a barren and rugged range with little in the way of vegetation to ameliorate their form. Of the ten objectives in my list, many may consider this to be one of the easiest, especially since it is the only one to be included in Classic Rock. It is should not be underestimated however, the failure rate is quite high even in these times of lightweight kit and supposed higher fitness. The current record stands at 3hrs 32mins and 15secs!! and is held by Andy Hyslop. Our tale begins with our annual Spring bank holiday trip to a Scottish Island. It usually comes down to Skye or Arran however. This time there is a large group of us, most are travelling up during the Friday but Cath and myself have to make do with setting off at Friday lunchtime. The reason? My final exam at college finishes at 11AM. This has also meant that the last few months have been taken up with study rather than keeping or even getting fit. It should be obvious from the previous sentence that I was a mature student! The projected travel time of nine hours (from N. Wales) becomes twelve, added to which the weather worsens as we head North. By the time we arrive tired and hungry at the campsite in Glen Brittle, it is nearer to a full gale rather than the fine clear weather promised in the forecast. Putting the tent up by headtorch was not a success and the shouting and arguing between us as we struggled only served to convince the others in the group to remain in their sleeping bags. Eventually we struggled into our pits and crashed out. The morning brought grey skies and spirits the same. At least it wasn’t raining. Somehow we had pitched the tent wrongly, as a result I had spent the night with the bottom end of my sleeping bag in a pool of water and thus had rather wet and cold feet. Once we had repitched the tent, we settled down for a few brews with the others. As the morning passed everyone felt better with regards to the weather and we set off for a walk across the moorland that lies to the west of the Cuillin. This was as much for spying out the path that we would hopefully take in the morning as for stretching out our limbs and having a nosey around. As the day wore on the cloudbase slowly rose. By early evening however the Cuillin were still shrouded in a grey blanket. We began a barbeque which in hindsight consisted of totally the wrong foodstuffs. I.e. instead of loading up with carbohydrate we stuffed ourselves on protein. At least the beer was carbohydrate! The sports plan was beginning to emerge: four of us wished to attempt the ridge. Duncan, Andy, John and myself. The others were intending to do some low level walks. Obviously they didn’t share our optimism that the weather would continue to improve overnight. The team sorted, we arranged our gear before a few more beers and turning in for the night with alarms set for 4am. The forecast for clear skies and a frost above 900m! The alarms woke an all too short night. However outside it was, as promised, clear. Seaward the moon hung low over the see, its pale light reflected from a remarkably smooth surface. After a quick breakfast we headed off at 4:30AM. From the off it was a brisk pace, not too fast but certainly not a stroll. The section reconnoitred the previous day passed quickly enough as the approaching day spread its light. By the time we reached the foot of Gars-bheinn it was fully light. The forecast of frost at 900m had been correct, as we gained height, the rocks were coated in a thin layer of hoar frost, maintaining a balanced position was precarious at times. As the sun rose above the horizon, the frost melted on the eastern side of the ridge but taking steps on the western side would remain dicey for some time. 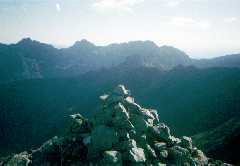 It had taken two hours to reach the summit of Gars-bheinn from the camp site. In retrospect this was too quick and we would have been better to have taken around 30 minutes extra. We rested a few minutes, shivering in the coolness of early morning. Eventually we decided that enough rest had been taken and we began. Almost the first sight we saw were a pair of climbers/walkers bivouacing on the ridge. Their bivvy bags covered in the hoar frost of the early morning cold. Why carry all that gear up to the ridge and fail to make use of the extra hours of daylight? Leaving them to their reverie we headed on to the next peak on the ridge. The going was not difficult but made awkward by the frost lying on the shaded side of the ridge and the larger boulders. It was now apparent that the forecast of fine weather was correct. We had a window of fine weather in which to make our attempt. We passed a few more parties bivvying on the ridge, again presumably to get a head start, as we approached the first Munro of the day: Sgurr nan Eag. A large notch in the ridge forced a small detour to the Coruisk side. Descending the well marked track to the twin cols either side of Am Casteil a thin mist rose from the deep hollow of Lock Coruisk. The deep pock marked rock hereabouts felt rough to the hands. At the next small summit we made the detour to climb Sgurr an Dubh Mor, one of the outlying Munroes. This proved to be trickier than expected with awkward route finding both in ascent and descent. This detour added around 45mins to the time. The path back to the main ridge passed over some old snow banks, still in evidence in late May and after a poor winter. We were now approaching the first of the main difficulties to be found on the ridge: The Thearlaich Dubh gap, more commonly the TD Gap. The ridge was easier here until it rose by an awkward climb, then scrambling to the near side of the gap. A voice hailed us as we neared. “There are fourteen of us here and another seven down in the gap.” It was true, we had come up to a traffic jam. The cause was a party of three climbing out of the gap on the other side. Rather than climb with sacks, each had elected to haul their sack. So the leader had climbed up, he then pulled the rope through the protection he had placed and threw it back down so that his colleagues could tie his sack to the rope. As he hauled, the sack snagged on rocks and occasionally became stuck. Each time it jammed, he would have to lower it and try to flick the sack so that he could attempt to pull it up via a different route. And there were another two of them going to do this! Some years earlier I had been climbing in Coire a’Ghrunnda and had scrambled up the gully leading into the gap before climbing the chimney on which the party of three were having so much fun. If we waited here we would never complete the ridge. I put my plan to the others. We would abseil into the gap and scramble down the gully then contour round the head of the coire before climbing Sgurr Alasdair via its west ridge. It was better than waiting for the twenty or so ahead of us to climb the gap. It would also mean that we would be ahead of the incompetents. As we began to descend, one of those waiting who had overheard our plan asked what we were going to do at the Inn Pin. “Act French!” I replied before setting off down the rope. The gully was - well gullyish, i.e. wet and care required with the rock and rubble lying in the bed. The traverse around the coire was easy. By the time we reached the ridge to the west of Alasdair the sun was out again. The others wanted to bag Sgurr Sgumain to the west of the col, I had been to its summit before when climbing on the crags below so headed towards Alasdair. A small wall felt very awkward in big boots so I waited above with a rope for assurance for the others when they arrived. Even in shoes they felt it was harder than it should have been. The summit of Alasdair was remarkably quiet. Had we got past everyone, especially the party of three? As we dropped down to the head of the Great Stone Shoot, we saw the three, they were heading toward Alasdair. We were in the clear! Dropping off Thearlaich is one of the trickier sections of the ridge that isn’t actually climbing. Boiler plate slabs seemingly hanging above the void of Coruisk need to be traversed and descended. Easy ground is soon reached which is followed to the foot of King’s Chimney on Sgurr Mhic Coinnich. A breeze is blowing as Andy grabs our minimal rack and romps up the cold rock, slowing only for a move or two below a large chockstone. He moves out onto the right wall and the climbing eases and he is soon at the top and belayed. The rest of us tie in at various points of the ropes and follow. An alpine attitude is best when time is short. The section dropping down from Mhic Coinnich lead past the top of the main cliffs of the Cuillin and I was interested to see if I could sneak a look at it without losing too much height. Unfortunately this wasn’t the case, however I had fallen behind the others and they were now heading up the long slog to the Innaccessible Pinnacle. We had thought of going over An Stac but had been told that it was loose so decided against it. There were parties descending it however so it cannot be that loose. The slog up to the Inn Pinn was as bad as ever and by the time it came into sight, John was already halfway up the staircase that is the East Ridge, Duncan and Andy having already reached its summit. At the foot of the ridge was another party. If I hurried I could get in front of them. By the time I arrived the leader had already begun so I was left with a choice: wait for them to finish, there were three of them; or act French! I chose the latter, excused myself and headed up the climb. The leader was climbing with a full rack, twin ropes and rock boots! Bit of overkill for a climb graded Moderate! I waited until he had placed his first runner then passed him. I think there were one or two mutterings. By the time I arrived at the summit the others were sitting on the ground opposite having a bite to eat. Using an 8 foot sling for a harness, I abseiled to the ground and pulled the rope. Sgurr Dearg is just short (timewise) of halfway along the ridge. More importantly, we now had three of the four rock climbing sections done, only the Bhasteir tooth remained. Between our current position and that climb lay a lot of ground, some of which is renowned as being tricky to negotiate. The descent from Sgurr Dearg is another long scree slope, in fact all the ways up this particular hill seem to be scree! From the col, An Dorus, a long gradual ascent leads to the next summit, Sgurr na Banadhich. It is now that I really begin to feel tired due to my lack of training. John being the oldest amongst us is, thankfully, about the same level of fitness. Duncan, being the fell athlete he is, is striding ahead with Andy in tow. Banadhich passes without incident save that I am becoming rather weary. It is hereabouts apparently that many parties give up. I know how they feel. Thormaid passes by in a blur, though the “Wart” proves memorable as the path around it is actually quite pleasant. The next peak is Greathaidh, and the crossing of this proves interesting with us having to cross hanging slabs that have a covering of loose gravel. These are interspersed with dykes of rotten rock. It takes some concentration to negotiate these. Again my footwear is not the best for this. Now comes Mhadhaidh with its four distinct summits. The first of these has a steep wall around 10m in height guarding it. As I reach the top, I realise that John may have trouble on this so throw down one end of the rope and bring him up on a direct belay round a convenient spike. The navigational nightmare of Bidean Druim nam Ramh approached. The ridge here turns nearly 90 degrees but is so disjointed due to several basalt dykes running through it that determining where to go is hard work at best. A basalt staircase led to the first of the peak's three tops. The next section is phsycologically the worst of the whole ridge: a long, long slope up to the next top never seems to get any nearer. The monotony of the ascent alleviated here and there by a jump across a dyke that cuts through the ridge. The final graded rock climb on the ridge traverse is Naismith’s Route on The Basteir Tooth. Although only graded VDiff it is very exposed. By now I was totally exhausted and really didn't feel like doing this, so I offered (read pleaded) the lead to Duncan. So with our minimal rack, Duncan, who is more of a fell-runner than a climber, headed upwards. It was obvious that he was rusty at placing gear, even if the gear we had was not run of the mill stuff. The route leads out rightwards amidst increasing exposure to a ledge before climbing crack systems upwards then rightwards to an awkward exit. My exhaustion was such that I felt that I could not do the climb. Just weeks earlier I was climbing E2s! yet the strain of traversing the ridge and my tiredness now caught up with me. The other two would follow on a rope each whilst I traversed around the northern side of Am Bhasteir. The north facing cliffs of Am Bhasteir are very impressive and probably worth another look. However at the moment I am more interested in getting round to the other side of the peak. To get to the col though is a long slog up loose scree, so I aim diagonally across the slope and end up at a slanting chimney. The chimney is surprisingly solid and leads me directly to the west ridge of Gillean. I turn left and head up the final climb of the day. At some point I pass the place where the Gendarme once stood but am too tired to notice. Eventually a rock “eye” appears on the left, I pass through this (it’s traditional I find out later to thread it) and the final summit is at hand. The others are already descending from Am Bhasteir. It will only be a few minutes before they too have finished. Finally the others arrived on the summit of Gillean twelve hours after leaving Gars-bheinn. Andy produced a can of Guiness for celebration. Then Andy, being Andy, rings a friend, who has always wanted to do the ridge, on his mobile phone to rub in the fact that we have done the ridge on our first attempt. Another couple arrive on the summit so we ask if they would take our picture for us, à la tourist in Red Square. The descent from the summit of Gillean lead along the narrow south ridge, with the occasional rock step. Slowly the ridge broadened until the path cut off leftwards into a hanging coire. We stumbled down the gully at the head of the coire and followed surprisingly vague paths to its lip. A further series of rocky steps led down to the moorland below. In the distance we could see the whitewashed walls of the Sligachan hotel where our friends and partners would be waiting. The hotel never seemed to get any nearer. Occasionally it would disappear from site, when it came into view again it was as far away as ever. By now everything was hurting as my sack was digging in despite weighing virtually nothing. With socks damp from sweating my feet were becoming ever more painful, the constant tripping over stones due to tired legs wasn't helping much. Eventually the burn that issues from Fionn Coire was reached, crossing this by the bridge soon lead to an easy path leading to the road a couple of hundred metres from the Sligachan. Two hours after leaving the summit of Gillean and sixteen after leaving Glen Brittle we had finished. The pub was packed and once food was ordered, we had to sit outside while nursing our blisters and sore bodies with only the occasional beer to slake our first. Sitting wasn't too easy since legs kept cramping up. Eventually our food arrived. Then it was back to the tent for a well deserved sleep. The following day, the cloud was once again covering the tops.